The end of another growing season is upon us, harvests have been gathered, and over winter planting has begun. The perfect time for a celebration of harvest and a get together without getting our hands dirty. 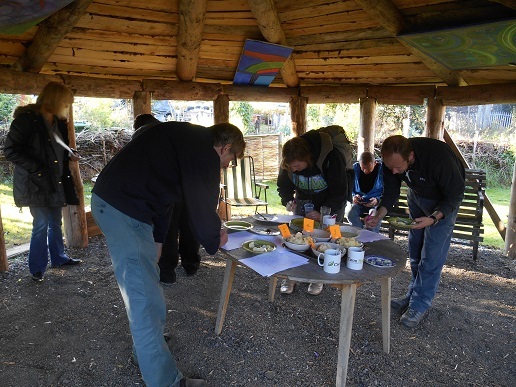 We have over 30 micro allotments and this time of year is when we get together around the fire to discuss successes and failures and plan the year ahead. After a rather wet morning the sky cleared and we had a bit of sunshine for the afternoon get together. Our regular chefs in the kitchen Alistair and Chris excelled with a fantastic feast of pizza and salad. But for starter we had a taste testing session to trial the five varieties of blight resistant potatoes that have been grown on site for the last two years as part of a trial to find ‘Easy organic potatoes’ that will suppress weed growth, give good yields with low input, and taste great. The results will be written up over winter and available next year, for anyone who is interest. We fired up the new cob pizza oven during the day, it takes a few hours to build up the heat in the oven, but once hot it will remain hot long enough to cook for a couple of hours. 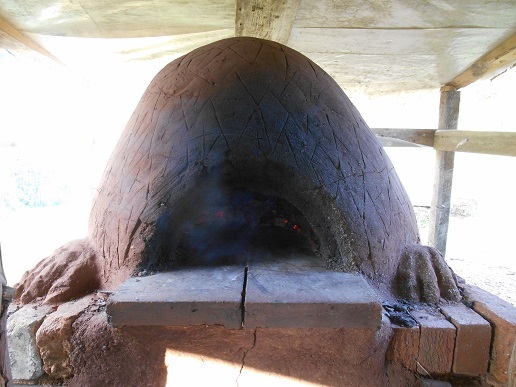 The oven had been built as a workshop during the summer and is situated just off the round house. Now the the oven has been tried and tested by our resident chefs are keen to have many more pizza sessions. 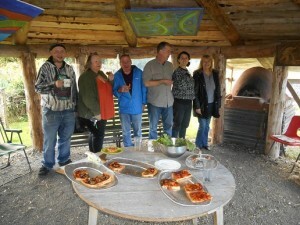 We will be firing up the pizza oven again on our autumn open day on November 8th. There will also be apple pressing, tours and talks, more info to follow. This entry was posted in Community Gardening, Events, local food, roundhouse by Emma Maxwell. Bookmark the permalink.